Breakfast time for our girls. Baby Cleo in the background with our mountain view behind her. Like so many people who have visited Santa Fe, my husband I found a special place in our hearts for this Land of Enchantment when we visited in the summer of 2013. 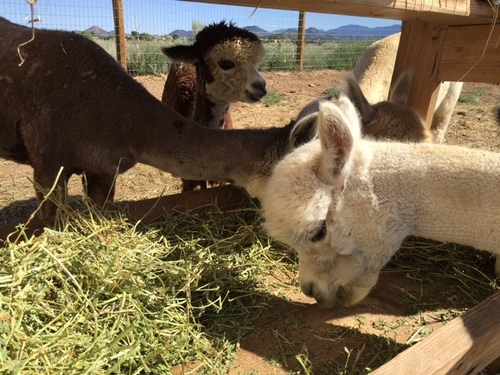 During our stay we visited an alpaca ranch and fell in love with these gentle creatures. When the opportunity to move here presented itself, we jumped. 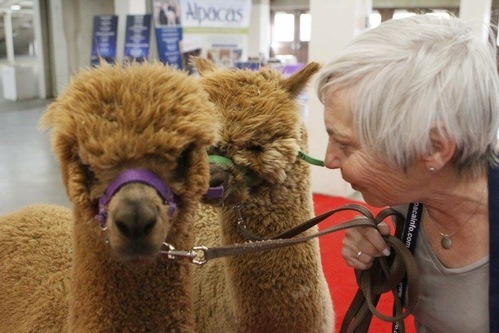 My husband and I come from different backgrounds, but together, our talents do support the venture of raising alpacas. As a lifelong knitter with less significant interest in crocheting, needlepoint, and weaving, I have always had a keen interest in fiber. How it looks, feel and even smells; I love it all. My husband was raised on a dairy farm in Pennsylvania. Not only does he know a lot about animal husbandry, he is a jack of all trades around the barn. Here at Wide Sky Ranch our goals are simple. We aim to produce enviable fleece for knitters, crocheters, and weavers via careful breeding decisions. We provide a calm environment for those people suffering emotional trauma. We maintain a warm and loving home for the animals which give to us so generously. And lastly, we revel in the quiet enjoyment of rural life. To learn more about us, please write to us at wideskyranch@gmail.com. We would love to tell you more about our plans and dreams! Call to schedule a complimentary ranch tour or visit our studio which is fully stocked for holiday shopping. With our elevation of 7,200', higher than Denver, we experience a myriad of weather conditions this time of the year. The lilac bush has budded, but lately we have had very high winds accompanied by brief snow showers. So we aren't going to go out on a limb and say it's spring quite yet. 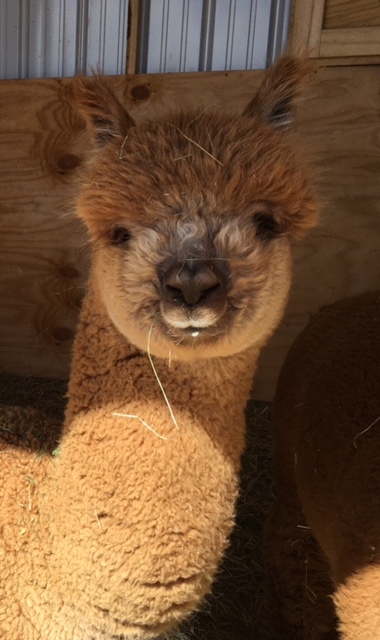 Two large alpaca shows are in the books now and we are so pleased with the fleece and halter results from Chance and Wyatt. The next time we will be competing will be this summer as we enter Chance's fleece blanket in the AOA National Fleece Conference in Sacramento, Ca. 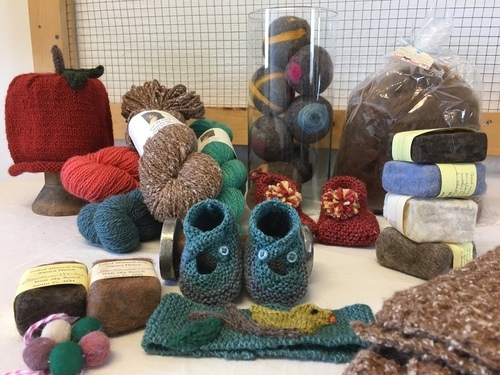 In the meantime, we are preparing for the NM Fiber Crawl in May as well as the El Rancho De Las Golondrinas Fiber Spring & Fiber Fest. So we are in full production mode, but never too busy for ranch tours. With spring breaks we have been unusually busy. Do you live in our area or plan a trip here? Just give us a call to schedule a free tour.